Throughout the whole story of Egyptian cinema, stretching back almost a century, the appearance of belly dancers on the silver screen was customary, whether through their acting or just dancing. Leila (1927), the first Egyptian silent film, witnessed the appearance of Bamba Kashar, a belly dancer and actress. Kashar was cast by her friend Aziza Amir, who was also the film’s producer and its leading lady, introducing the belly dancer to the silver screen. A year later, another belly dancer of Turkish origins called Ifranz Hanim starred in a film titled Life’s Tragedy (1928) directed by Wadad Orfi (also the director of Leila). The censorship department confiscated the film after it was completed, stating that it constituted an insult to the Egyptian people. However, despite such objections, from that point on, it was rare to find an Egyptian film, even those with historical and religious themes, without at least one scene featuring a belly dancer. Belly dancers became ubiquitious in movies, but few left a worthy legacy. 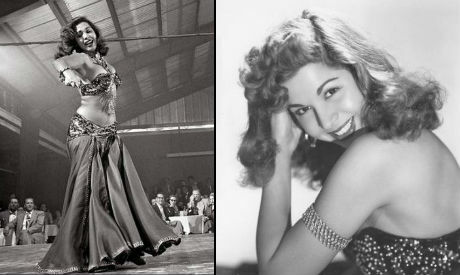 Among the few, of course, was Samia Gamal, who once was labelled "Egypt’s Official Belly Dancer". Samia Gamal’s real name was Zeinab Khalil Ibrahim Mahfouz. She was born in Wana, Beni Suef governorate in Upper Egypt in 1924, at the time when the belly dancing stars were Bamba Kashar and Shafiqa Al-Qibtiyya. When the girl was 12 years old, her talent in dancing began to blossom. She began to realise that her future was in Cairo, especially after her father died and she was obliged to work as a seamstress. At first, she worked among extras in the dance troupe of Badia Masabni, the most famous entertainment artist at the time, one who had launched the careers of many well-known belly dancers. Badia Masabni taught and encouraged the young girl, giving her the stage name of Samia Gamal. She also pointed her to the renowned dance instructor Isaac Dickson, who trained her until she became one of the brightest dancers at the time. It didn’t take long for Samia Gamal to become the official representative of Egypt in international forums, including the Red Crescent and the Red Cross charity conference in Paris in the mid-1940s, which was attended by King Farouk, the king of Egypt and Sudan. Samia Gamal wasn’t a traditional belly dancer. She distinguished herself by expressive dancing and distinctive body language, combining the spirit of Oriental dancing with Western dancing techniques, topping them off at times with some ballet moves, all of which nurtured her unique stage presence. Indeed, Samia Gamal wasn’t just a skillful belly dancer; she has also left an important imprint on the cinematic realm. Suffice to say that she was the leading lady in a number of Egyptian cinema classics: Red Lipstick with Naguib Al-Rihani (1946), directed by Wali Eldin Sameh; Lady Ghost (1949) along with Farid Al-Atrash, by Henry Barakat; The Hawk (1950) with Emad Hamdy, by Salah Abu-Seif; The Count of Monte Cristo (1950) with Anwar Wagdi, by Henry Barakat; The Monster (1954) also with Anwar Wagdi, by Salah Abu-Seif; The Second Man (1959) with Rushdy Abaza, by Ezzel-Dine Zulfikar; and Sukkar Hanem (1960) with Abdel-Moneim Ibrahim, by Al-Sayed Bedeir. But let us look back at Samia Gamia’s career before she became an iconic belly dancer and a sought-after actress. Before making it to the leading roles in many films, Gamal worked as an extra in films such as The Determination (1939), directed by Kamal Selim. As an extra, she earned symbolic amounts, such as ten piastres a day. Naturally, nobody took any notice at the time, although she at least became used to the camera's gaze. After a number of minor roles in the 1940s, Gamal was ready to seize more prominent appearances in the following films: The Triumph of Youth (1941), directed by Ahmed Badrkhan; Love is Forbidden (1942), by Mohamed Karim; On the Stage of Life (1942), by Ahmed Badrkhan; Les Misérables (1943), by Kamal Selim; Who’s the Culprit (1944), by Ahmed Badrkhan; and Bullet in the Heart (1944) by Mohamed Karim. By 1946, Gamal was fully prepared to play the leading lady, which she achieved through the comedic giant Naguib Al-Rihani. He produced and starred in Red Lipstick choosing Gamal for the female leading role. She didn’t wait long for her next artistic leap, with the musician Farid Al-Atrash making her the female star of Lifetime Sweetheart (1947), which he produced and starred in, directed by Barakat. Thus, the period of the successful couple Farid Al-Atrash and Samia Gamal was launched, resulting in six films made between 1947 and 1952, all of which were landmarks in Egyptian musical film history. They were: Lady Ghost, The Last Lie (1950), directed by Ahmed Badrkhan; Come Over and Say Hello (1951), by Helmy Rafla; Don’t Tell Anybody (1952), by Barakat. These films were made hand in hand with rumours circulating about the tempestuous love between the two big stars. Perhaps these films were the ones that established Samia Gamal’s presence within the successful commercial formula of the musical comedy, which dominated the cinematic public mood after WWII and throughout the 1950s and 1960s. This explains Gamal’s permanent presence in those films featuring singers such as Mohamed Fawzi, Abdel-Aziz Mahmoud, Karem Mahmoud and Abdel-Ghani Al-Sayed, as well as her noticeable participation with Farid Al-Atrash. But to be fair, we must mention that Gamal wasn’t just a component of the successful commercial formula or that her dancing skills permitted her a space in the films of that period. She also displayed good acting skills, prompting big directors to cast her in films that had nothing to do with musicals. These include: Salah Abu-Seif’s movies The Hawk and The Monster; Barakat in The Count of Monte Cristo; or Ezzel-Dine Zulfikar’s The Night Train and The Second Man. It is in those films that Samia Gamal reached the zenith of her acting career. Devoting more time to marital life after her marriage to Rushdy Abaza, Samia’s participation declined to the extent that she only made 12 films from the early sixties to her 1972, including eight years, between 1964 and 1972, during she didn’t act at all. In 1972, she made her final film, The Zero Hour, directed by Hussein Helmy El-Mohandes, and The Devil and the Autumn, directed by Anwar Al-Shennawi. Both films starred her husband at the time, Rushdy Abaza. Gamal didn’t only stop acting in 1972; she also retired from dancing in public, until Samir Sabri convinced her to return to dancing in 1984, spending two years in his company. After which, she decided to leave the limelight for good, until her death on 1 December 1994. Twenty-three years after Samia Gamal's passing, her impact on Egyptian movie history is still felt strongly.